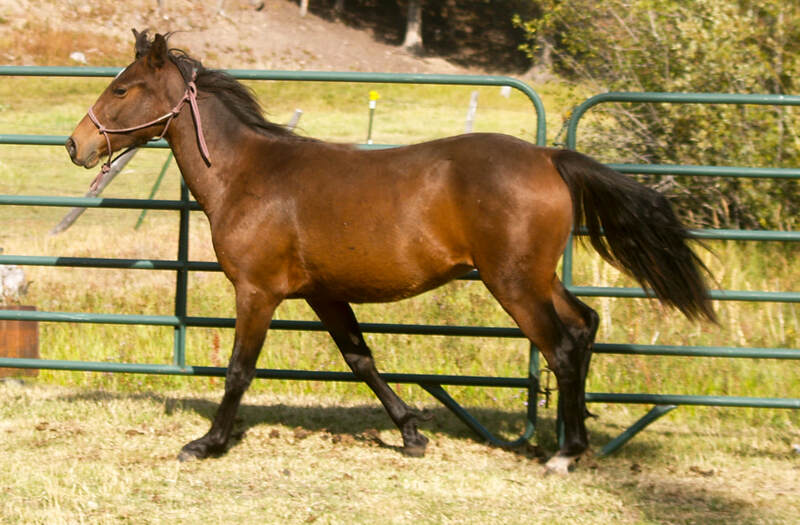 In horses, a brown body color is usually called bay. This indicates a brown or red body with black on the mane, tail and legs. Genetics: A bay horse must have a dominant E gene. Thus it could either be: (EE) or (Ee) at the E gene. The A gene (responsible for lightening the horse to bay instead of leaving it a solid black) must also have at least one dominant A gene, and thus could be either (AA) or(Aa). Description: Bay horses have a brown or red body color with black mane, tail and (usually) legs. The black on the legs often bleeds into the brown body color as it reaches higher up on the legs. 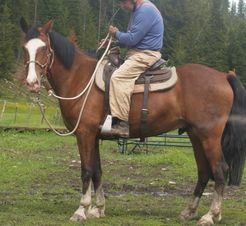 This Bay horse has an almost red body color but a black mane and tail. His legs have some red, fading to black. 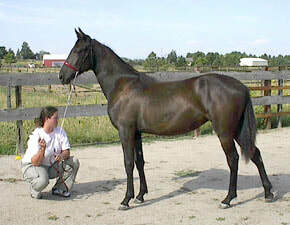 This Bay horse is a very typical bay with a light-brown body, black mane and tail and mostly black legs. Though many horse colors are significantly different at birth from their appearance as adults, Bay horses are generally born looking pretty similar to how they will look as adults. Their body color will be anywhere from red to dark brown and their mane, tail and legs will be black. Paint - If a paint horse's base color is bay, then the paint will be a tricolored paint with a body color anywhere from red to almost black, a black mane and tail and legs, all interrupted by random, large splotches of white. Roan - If a roan horse's base color is bay, it will be what is known as a bay roan, having all the normal coloring of a bay horse with interspersed white hairs all over the body, legs, mane and tail. There are a other colors which are sometimes be mistaken for bay. Chestnut - The bay coloring can sometimes produce a red body, but a bay horse's main and tail are always black, whereas a red horse's main and tail are either red or white, so these is easily distinguished from each other. This Bay horse has a very red body color, but the black mane and tail make it impossible to mistake for Chestnut or Sorrel. Buckskin - A particularly dark buckskin may easily be mistaken for a bay. The buckskin gene lightens the body color of a bay horse, usually making it closer to tan or gold. But occasionally the lightning effect will be slight enough that it is hardly noticeable. Dun - A particularly dark dun may be easily mistaken for a bay. 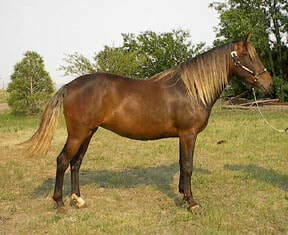 In this case, the dark dorsal stripe may be hidden by blending into the darker body color, and the primitive markings on face and legs may only be noticeable when the horse is in summer coat and in bright sunlight. 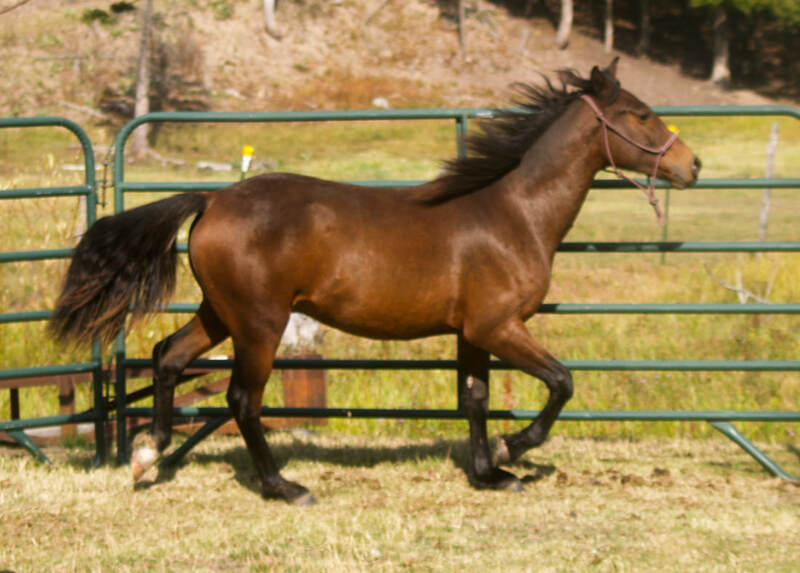 This dun horse is easily mistaken for a classic bay, especially in winter when her coat is darker and shaggier. This Red Chocolate horse has enough dark hair in her mane and tail to almost be mistaken for a bay horse. Gray - All gray horses start out a different color. A gray horse with a bay base color could easily be mistaken for a bay until it gets older and its coat starts to turn. This filly began looking speckled with white within a year and turned solid white by the time she was ten years old.